Please add newsletter@imageskill.com to your safe sender list or address book. For instructions on how to add this to your address book or safe sender list, please go here. Just now, we upgrade our products for registered customer free of charge. 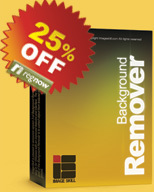 As subscriber you can order Background Remover with 25% discount. Use this tutorial to learn how to extract an object from an background texture. ImageSkill is pleased to announce version 3.1 of Background Remover plug-in for Windows with an improved feature and interface. The main goal of the Background Remover is to extract object from textured background. The cutting objects may be used for collage, scrap-book and greeting card creation. It fast and easily extracts opaque and semitransparent objects from a complex background of a digital image while preserving edge detail, such as hair or blurred edges. You only need to mark very roughly an object and background and choose the cutting out tool from a toolbar. Object extraction is achieved in a shorter amount of time than using competitive tools and techniques. In version 3.1 multilingual interface (English, German, French, Italian, Spanish, Dutch, Russian, Japanese, Chinese Simplified, and Chinese Traditional) is supported. Switching between original image and result one and preview the extracted object against a colored matte background for result checking. Plug-in has simple install and un-install procedures and automatically detects suitable graphics hosts. ImageSkill Background Remover is compatible with Adobe Photoshop and Photoshop Elements, Corel (Jasc) Paint Shop Pro, Corel Painter, Corel Photo-Paint and Microsoft Digital Image Suite. 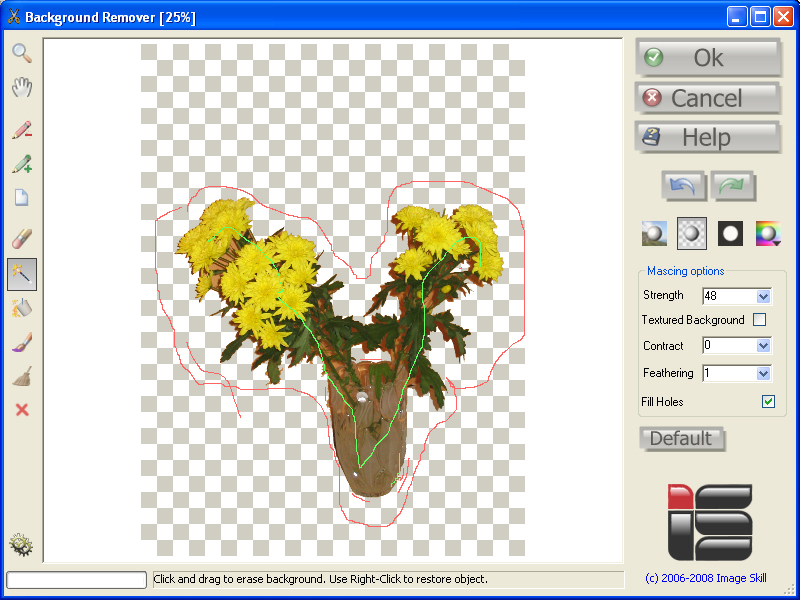 ImageSkill Background Remover runs on Microsoft Windows 2000/XP/NT/Vista. The full version of ImageSkill Background Remover is available for $49 including VAT. Our team works in the image processing area since 1998 year. Over the last ten years we have worked for the JASC Software Inc., specializing in creation of photo-editing software. (In 2004 JASC was acquired by Corel Corporation). We took an active and very productive part in developing of the last four versions of their software (JASC Paint Shop Pro 7, 8, 9, Corel Paint Shop Pro X). Also we have developed image enhancement tools for LG Electronics. Recently we started the selling of our products under ImageSkill trademark. Copyright Â© 2006-2008 ImageSkill Software. All rights reserved.